Most people are familiar with the health benefits of fish oil for humans, but did you know that oils rich in omega-3 fatty acids, such as salmon oil, have a wide array of benefits for our canine companions as well? Salmon oil specifically designed for dogs can boost your pet’s immune system, improve the look of his coat and skin and protect him against various chronic diseases. In fact, if you’re looking for a natural and simple way to improve your furry friend’s diet and boost his overall health and cognitive function, get him some high-quality salmon oil. To help you pick the best salmon oil for your pet, we read, tested and examined dozens of different fish oils for dogs, and came up with a list of top 8 salmon oils for dogs. Read on to find the right product for your four-legged companion. 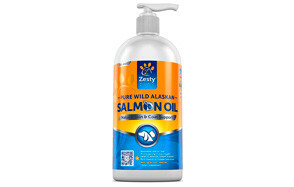 Completely natural, without artificial additives or colorings, this salmon oil from Zesty Paws is one of the purest fish oils on the market. 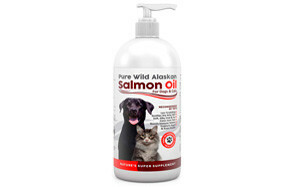 Rich in omega-3 and Omega-6 fatty acids, EPA and DHA, wild Alaskan salmon oil provides excellent nourishment for dogs (as well as cats) of all breeds and ages and supports cardiovascular and joint health, immune function, and promotes skin and coat health. This is pure salmon oil, meaning it’s in liquid form, so it’s easy to add it to your pet’s regular diet. Just add a couple of pumps to your dog’s food, mix it well and let her eat with pleasure. The oil is of pleasant smell and tastes amazing to dogs, so you won’t have a problem adding this salmon supplement to your pet’s diet. Sourced from wild Alaskan salmon, this 100% pure fish oil is of superb quality, without any additives, artificial flavorings or colorings. Containing more than 15 omega-3, omega-6 and arachidonic fatty acids, this salmon oil supplement promotes general well-being, lowers inflammation and improves the look of dog’s coat and skin. This supplement is in liquid form (pure salmon oil), so to add it to your canine’s diet, all you have to do is squirt some oil into his favorite food, mix it together and let him eat it. To avoid digestive issues, make sure you follow the directions on the bottle and use the right amount of oil for your dog’s weight. One of the best-liked salmon oils for pets on the market, the Paws & Pals fish oil is not only rich in essential omega-3 and omega-6 fatty acids, but contains a bunch of naturally occurring beneficial ingredients, including vitamin D, several B vitamins, as well as minerals phosphorus, biotin, potassium, iodine and choline. Excellent for dog’s inside and outside health, this salmon oil supports heart, brain and joint health, as well as the look of the pet’s coat and skin. Like all other good-quality fish oils, this salmon oil is also excellent for allergies your pup may struggle with. Since this is an oil in liquid form, to feed your dog, add it to their regular food (solid or wet), mix well and watch our furry friend dine with pleasure. Affordable, made in the U.S., high-quality salmon oil for pets? Yes, there actually is such a thing, and it’s called Vital Pet Life salmon oil. Rich in omega-3 and omega-6 fatty acids, with an optimal ratio of EPA and DHA, this fish oil supplement helps lower inflammation and joint pain (arthritis), supports cardiovascular health and immune function, and improves the look of the animal's skin and coat. 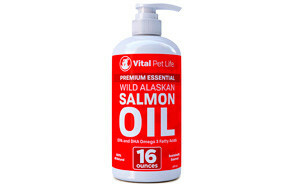 The Vital Pet Life’s oil is produced from wild Alaskan salmon, and made in the U.S., in an FDA-registered facility. Furthermore, the supplement is 100% natural, contains no GMO by-products, artificial flavorings, preservatives or colorings. Since it’s in liquid form, it’s easy to mix it with your pet’s usual diet. The Pure Paw Nutrition’s fish oil is a great quality (wild) salmon oil for pets, that comes in a handy, eco-friendly, BPA-free 8oz bottle with a pump. Containing omega-3 fatty acids, this supplement is excellent for relieving or completely preventing dry, itchy skin, excessive shedding and allergies. And like all good-quality salmon oils, it’s good for heart and brain health and dog’s overall well-being. This wild Alaskan salmon oil is completely natural, meaning it contains no preservatives, additives, colorings or toxins (the manufacturer even sites the oil doesn’t contain mercury!). Like all pure salmon oils, this supplement too is in liquid form, so to add it to your furry friend’s diet, squeeze a pump or two to his regular food, mix, and watch your pet enjoy his meal. If you’re looking for a good quality salmon oil that has been filtrated to have less smell (some would even say no smell at all), then you need to try the Iceland Pure’s fish oil for pets. Rich in omega-3 fatty acids, detoxified to remove all traces of toxins and heavy metals, this salmon oil is great for supporting canine’s cardiovascular health, cognitive function and for improving the look of his coat. The Iceland Pure salmon oil comes in a handy, brushed aluminum bottle with a pump, so it’s easy to add it to your pet’s food. It should also be noted that this oil is regularly being tested for purity, and is in accordance with European safety standards. The Finest Pets’ salmon oil is affordable, of excellent quality, and with impressive health benefits. Packed with omega-3 and omega-6 fatty acids, this supplement helps prevent excessive shedding, dry and itchy skin and allergies, while boosting the animal’s heart and brain health and overall well-being. This fish oil is produced from wild Alaskan salmon, it’s 100% natural, meaning it contains no additives, preservatives or fillers of any kind. Like all pure salmon oils, the Finest Pets’ supplement is also in liquid form. To add it to your pooch’s diet, just squeeze a few pumps into their regular food (but make sure to follow directions and use the right amount for the weight of your dog). One of the finest quality salmon oils on the market, the Pooch and Pet Co.’s fish oil comes from organic, wild Alaskan salmon oil. Packed with beneficial omega-3 fatty acids, it helps support your pup’s heart, brain and joint health, as well as the immune function. It’s also wonderful for improving your pet’s coat and skin appearance, as it reduces excessive shedding and relieves the symptoms of dry and itchy skin. This supplement is completely natural, safe for all dog breeds and sizes. There are no filler ingredients, artificial preservatives or colorings, and the oil is made in the U.S, in an FDA-registered facility. Like all salmon oils reviewed here, this one too is in liquid form, so it’s simple to add it to your pet’s diet. Brand: Pooch & Pet Co. Pure salmon oil has so many health benefits for canines, it deserves its own chapter – which is why we’ll talk about it down below. What we should focus on now is finding the best salmon oil supplement for your pet(s). Since we’ve covered the reviews, all that’s left now is to pick your favorite product from the list and purchase it. Sound simple, right? Of course, we understand the hesitation – after all, we all want the best for our four-legged children, and with so many different options on the market, finding the right supplement can be a little overwhelming. But that’s what we’re here for – to help you find the absolute best product that both you and your furry friend will love. Read this simple and hopefully useful buying guide, as well as the frequently asked questions we’ve answered, to get a clearer picture of what salmon oil is, what it is for, and how to use it. Essential fatty acids, including the omega-3 and omega-6, have several important functions in the body (both canine and human! ), including affecting inflammation, behavior, mood and many other cellular functions. Basically, omega-3 and omega-6 fatty acids are absolutely essential for health and wellbeing. The only problem? Just like a human body, an animal body cannot produce it on its own. This means that the only way your dog can get these crucial nutrients is through diet. Luckily, there is one food that is rich in essential fatty acids, both omega-3 and omega-6. Can you guess what it is? Yep, it’s salmon oil. Salmon oil is one of the best supplements you can give to your pet. Here is why. Packed with omega-3s, salmon oil can help protect your furry friend’s heart health. Omega-3 fatty acids help lower cholesterol and high blood pressure and prevent irregular heart rhythm. All good-quality fish oils, but especially salmon oil, can help support canine brain health. As a matter of fact, regularly consuming it can also boost cognitive function and mood. Omega-3s are mostly famous for their ability to lower inflammation. This is excellent news if your pup suffers from joint and/or muscle pain, or has arthritis. Granted, salmon oil can’t actually cure your pet of arthritis, but it may reduce the symptoms so much it can look like it can. Salmon oil’s anti-inflammatory properties also help boost the function of the immune system. This means that if your furry pet consumes fish oil regularly, he is less likely to get sick, suffer from allergies and various skin disorders, including eczema. One of the main reasons many people give salmon and other fish oil supplements to their pets (both dogs and cats), is because of the oil’s ability to improve the look of the animals’ coat and skin. Basically, salmon oil can help your dog shed less, soothe skin irritations and allergies and eliminate dandruff. Best of all? If consumed regularly, it can lead to shiny, thick, smooth coat. Because it’s rich in omega-3 fatty acids which help lower overall inflammation, salmon oil may help prevent cancer in dogs. An optimal ratio of EPA to DHA can also help slow cancer cell growth. Most people are familiar with fish oil, and by extension, salmon oil as well. But what about krill oil? Here, we outline the main differences between these similar supplements, so you can choose the right one for your pooch. Fish oil can be derived from various fatty fish, including mackerel, anchovies, cod, and of course, salmon. It contains valuable nutrients, including essential fatty acids, that play important biological roles. The quality of a fish oil depends on the type of the fish used, as well as the way that fish lived (caught wild or farm-raised). Likewise, how much vitamin A or D, as well as how much heavy metals a fish oil contains, varies from oil to oil. Salmon oil comes from fish salmon, usually the leftovers such as intestines, fins and head. As frequently mentioned in this article, the salmon oil contains great amounts of essential fatty acids, both omega-3 and omega-6, along with moderate amounts of EPA and DHA (depends on the type of fish – if wild, more EPA/DHA content, if farm-raised, less EPA/DHA content). In general, salmon contains very little to no mercury, so it’s one of the safest and healthiest fish oils your pet could consume. Importantly, it also doesn’t contain vitamin A, which means you can relax about potential vitamin A toxicity – with salmon oil, this cannot happen. Krill oil is derived from crustaceans, or krills, which are small aquatic animals. Like regular fish oil, krill oil is also a good source of omega-3 fatty acids, and by extension, DHA and EPA. Although krill oil is sometimes marketed as superior to fish oil, it should be said that there is still no sufficient evidence to suggest that. Still, krill oil is on average more expensive than fish oil, including salmon supplements. While salmon oil is an excellent supplement for most canines, it doesn’t come without possible side effects if you’re not careful with the dosage and the quality of oil. To prevent nausea, digestive issues and diarrhea, make sure you follow the directions and recommended dosages on the label of a salmon oil supplement. Usually, the dosage depends on the weight of your hound, so make sure you know how heavy your pet is before actually giving him any fish oil. Like all oils, salmon oil is pretty high in calories, and if you’re not careful about the dosage, your dog may gain quite a bit of weight. Of course, this side effect can easily be avoided if you follow the instructions on the label, feed your pet a healthy diet and make sure she exercises regularly. If any fish oil, including salmon supplements, doesn’t smell and taste at least a little like actual fish oil, something is probably wrong with it. So naturally, if you give your furry companion salmon oil frequently and regularly, you can expect his breath to change a little. However, this can be resolved easily with a proper oral hygiene. Q: Is salmon oil safe for puppies? If you have a young pup, you’re probably wondering if it’s safe to give him salmon oil supplements. We have some encouraging words for you – not only is salmon oil safe for puppies, it’s recommended for their brain development, heart and immune system support, and shiny and smooth coat. Q: How much Salmon Oil should I give my dog? Always follow the recommended dosage on the oil’s label, which is based on the canine weight. Normally, the heavier your furry companion is, the greater the dosage should be, but do make sure to follow the directions. As for potential health issues your pooch may suffer from, they can play a role in dosing salmon oil as well. For instance, if your dog suffers from heart problems, he may require more fish oil than healthy dogs. However, it’s always best to talk with your veterinarian, as they know your pet’s specific health problems and are able to give the best advice. Q: How often should I give my dog Salmon Oil? Salmon oil has many health benefits and very little side effects, most of which can be avoided if you’re careful anyway. Therefore, the longer your hound consumes this supplement, the better. Normally, you want to follow the guidelines on the label, but generally speaking, it’s best to give your four-legged friend salmon oil every single day. Just mix some oil with his regular food and let him eat his way into health. Another reason to give your pooch salmon oil every day is so you can use it up before the expiration date. Besides, all fish oils are best when used fresh. Q: Can I give my dog Human fish oil capsules? Human fish capsules sometimes contain soy: although soy may be ok or some people, it isn’t for most dogs. Soy acts as an endocrine disruptor and may interfere with the body’s ability to use minerals such as iron, zinc, calcium. The dosage is different: human fish capsules usually contain 500mg, 750mg or 1000mg of fish oil. This can make following the recommended dosage for your dog’s weight difficult, so for that reason, it’s best to stick to dog-only salmon oils. Q: Is Salmon Oil good for dogs with Cancer? If your pooch has been diagnosed with cancer, or you want to work on her cancer prevention, make sure you supplement her with good-quality salmon oil. Omega-3 fatty acids have been proven to lower inflammation, reduce the risk of developing cancer and even slow the progression of tumor growth. Q: Will salmon oil help with my dog’s joints? As mentioned, all fish oils, but especially salmon oil, help reduce overall inflammation, and as a result, joint and muscle pain. So, if your pooch suffers from stiff, painful joints, or has arthritis, salmon oil supplements should greatly help reduce pain and actually promote proper joint function.